Posted November 5th, 2014 by TheGolfersClub & filed under Blog, Golf Tips. In Medal golf and other individual competition, players generally tee off in three-balls. But when it comes to the Sunday roll-up or a “bounce game” among friends, three is never viewed as the magic number. But this doesn’t have to be the case. Here we give some of the best options for you to enjoy a competitive game when playing in a three-ball. Each player takes on the other two group members in standard singles match play format. Handicap allowances are taken against the lowest player; the higher players should receive the full difference. In this format, even if you’ve been thumped by one of your playing partners, you may still have a chance of redeeming yourself against the other. Or, you could try a best ball match. The lowest handicapper competes against the best ball of the other two. To describe this, let’s call the players A, B and C. The lowest handicapper plays off scratch, the other two receive ¾ of the difference. For the first six holes A takes on the better ball of B and C, for the next six B takes on the better ball of A and C and for the final six C takes on the better ball of A and B. If the single player wins a hole he gets a point, if the pair win a hole they both get a point. The winner is the man with the most points after 18 holes. Each hole is played to the match play format for six points. The winner of the hole receives four points and the runner-up gets two points. If the runner-up spot is shared, the players receive one point each. If two players tie to win the hole they both receive three points. If all three tie the hole, they receive two points each. The winner is the man with the most points after 18 holes. The object of the game is to win points, but you can only do it when you’re “on the perch”. To get on the perch you must win a hole outright from your playing partners – full handicap allowance. 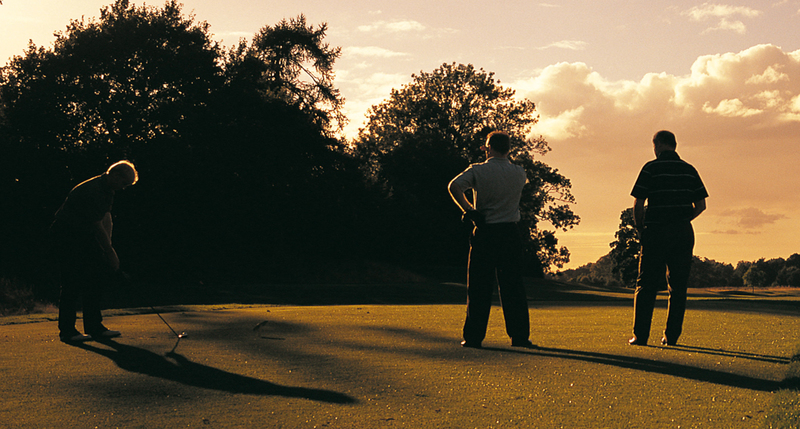 Once on the perch you can gain points by winning further holes outright – a point a hole. But, if one of your partners wins a hole outright they will knock you off the perch and take the position for themselves. The winner is the man with the most points after 18 holes. One of you plays as a single, the other two play alternate shots with one ball, as in foursomes. You could play a Medal, Stableford or matchplay competition. For Medal and Stableford, the single player should receive his full handicap while the pair receives half their combined handicap. In matchplay, whoever is higher (the single or half the combined total of the pair) should receive the full difference. Played with full handicap allowance, the objective is to win a hole outright against your two playing partners. If this is achieved, you earn one “skin.” If nobody wins the hole outright, the following hole is worth two “skins,” another tie and the following hole will be worth three. The skins accrue like this until someone wins a hole outright, at which point the following hole will be worth one skin again. The winner is the player with the most skins at the end of 18 holes. So if you arrive on the first tee and find your weekly fourball reduced to a three, don’t panic, there’s no need to revert to individual strokeplay or Stableford. Consider one of the options above and keep things a good deal more sociable.